A fresh start. Khloé Kardashian and Tristan Thompson started the new year on a high note — hosting a joint New Year’s Eve party in Cleveland and sharing a smooch at midnight. The reality star, 34, and the NBA player, 27, took Rumor Bar & Lounge by storm on Monday, December 31, and looked happy as could be together as they documented the night on their Instagram Stories. Kardashian started the evening by sharing a sweet video of herself with her love at the event. She stunned in a black-and-silver minidress, while her beau went for a casual cool look, wearing his overcoat open and baring his chest with an unbuttoned shirt. “Happy New Year’s,” Thompson said in Kardashians first clip. “God bless everybody. Be safe. Don’t drink and drive. Don’t drink and drive.” In a second Story, the Strong Looks Better Naked author showed off a custom “Koko & TT 2019” carved ice sculpture in their honor. The Good American founder later shared a video of herself with Thompson standing behind the DJ booth. The athlete counted down from 10 on the microphone while speaking to the crowd. The couple then shared an intimate kiss as they turned the page on 2018. Thompson, for his part, danced the night away with Kardashian and pals including his Cleveland Cavaliers teammate Kevin Love. Their outing came after Kardashian celebrated Christmas in Calabasas, California, with their 8-month-old daughter without Thompson. 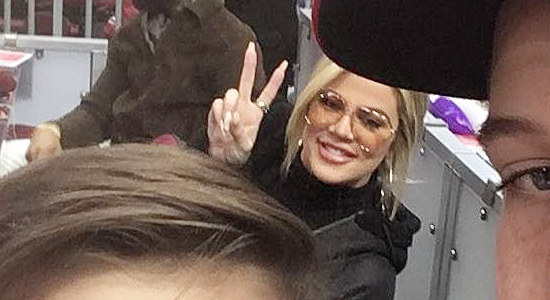 ALL details: Khloe Kardashian spends 34th birthday with Tristan Thompson, her sisters and friends!